Career Highlights – Everett L. Dodrill Jr.
Costume for Phyllis in Follies, worn by actress Marji Dodrill, designed by Denájua Couturiére. After the death of my mother, the late Cleveland actress Marji Dodrill, we came across one of her costumes while cleaning out the family house. A beautiful purplish-blue gown with hand-sewn beads. I called Cleveland’s Western Reserve Historical Society (WRHS) museum to see if they would like it for their permanent costume collection. Danielle Peck at the museum informed me that they, unfortunately, already had 18,000 articles of clothing in their collection! However, when I mentioned that the dress was worn in Follies, a play celebrating nearby Cleveland Heights’s 50th anniversary of Cain Park, and was designed and made by local fashion designer “Denájua,” she showed interest and said yes. They accepted the dress into their Lesbian, Gay, Bisexual and Transgender (LGBT) archives, as Denájua Couturiére is a member of that community. She notably designed and made six costumes for the production of Follies. 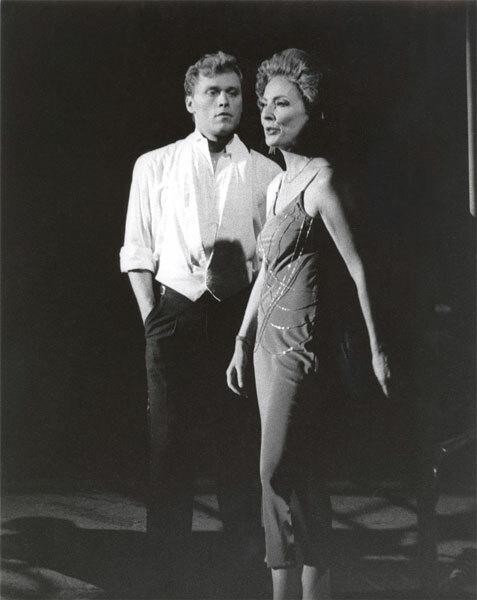 The show was a Stephen Sondheim musical directed by Victoria Bussert. 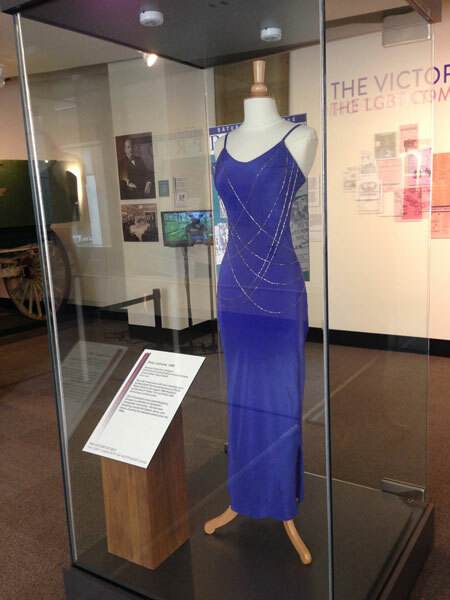 The dress is currently on display (and looks gorgeous) in an exhibit titled, The Victory of Self Will Capture the Civil Rights Movement of Northeast Ohio’s LGBT Community, which was constructed in honor of the 9th Gay Games, in Cleveland August 9-16, 2014. 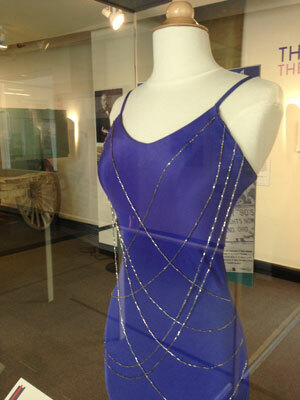 Blue silk v-neck dress with silver beading worn by Marji Dodrill for her performance as Phyllis Rogers Stone in the August 1988 theatrical production of “Follies” for Cain Park’s 50th Anniversary summer series. One of Cleveland’s most noted designers, Denajua, is a member of Cleveland’s Transgender community. She has been designing costumes for theater, dance and drama, as well as for individual clients since the 1980s. According to WRHS, the exhibit will be on display during regular museum hours beginning July 20, 2014 and is anticipated to run through early January 2015. Access to the exhibit is free with the price of general admission to the WRHS History Center: $10 adults, $5 children ages 3-12, and free for WRHS members. 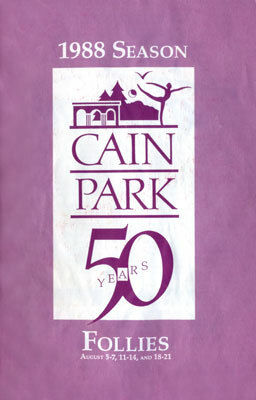 Follies Playbill Cover, Cain Park, 50 Years, Cleveland Heights, Ohio, 1988. 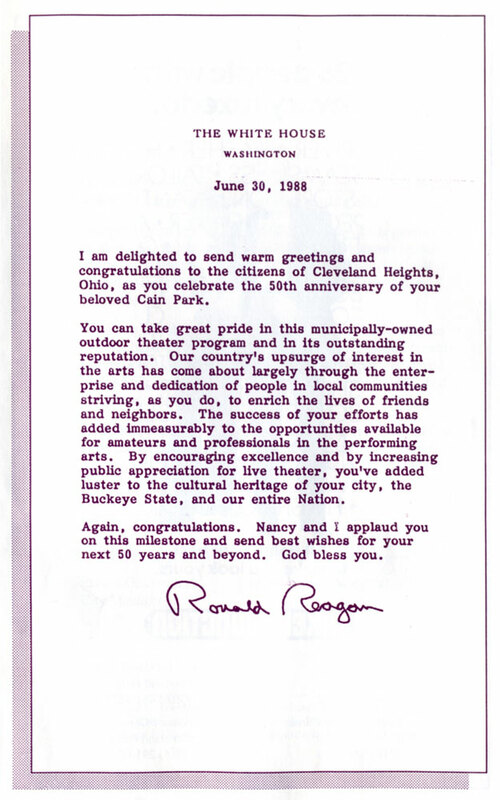 Letter from Ronald Regan in Follies Playbill, Cain Park, Cleveland Heights, Ohio, 1988. Special Thanks to Denájua Couturiére in Follies Playbill. Marji Dodrill as Phyllis in Follies, Cain Park, Cleveland Heights, Ohio, 1988, wearing dress designed by Denájua. 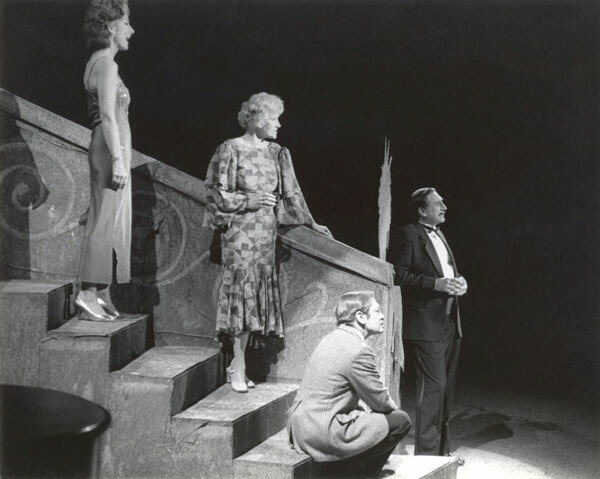 Marji Dodrill (left) as Phyllis in Follies, Cain Park, Cleveland Heights, Ohio, 1988. 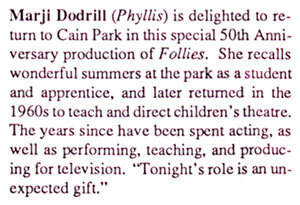 Marji Dodrill as Phyllis in Follies, Playbill Biography, Cain Park, Cleveland Heights, Ohio, 1988. Costume for Phyllis in Follies, worn by actress Marji Dodrill, designed by Denájua. Are you keeping your dreams and passions alive? Do you believe in yourself? I find that sometimes my dreams get put aside while I deal with life’s responsibilities. I like the idea of setting a time each day to allow myself to dream. 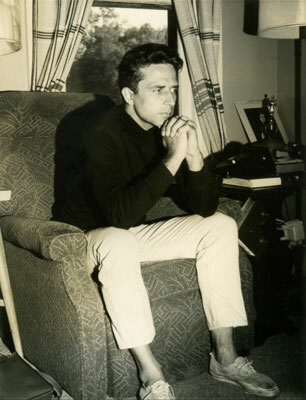 It may be three minutes past eight as an actor would do during a scheduled performance, it may be noon each day, or late in the evening when reflecting on one’s day. As an artist, I need to keep dreaming and creating. I need to tap into my ‘source’ for vision and inspiration. Why is it we learn so much more about people after they go? You’ve probably heard the expression that an artist (the same may be the case for authors, musicians, composers, and other creative people) never really get famous till after death! Since my dad, Everett Dodrill, died earlier this month, we have pieced together many more facts about his life. People have provided us photos and stories of their encounters with “Ev”. Now I’ve gone from proud to really proud. We wish we knew some of these facts when he was alive to let him know just how wonderful he was and how good a life he had lead. We also heard his life’s story according to him in his final months–what a treasured time to hold onto. People are more complex than we see day-to-day. Have you gotten to know your elders and their accomplishments? What about past generations in your family?